It is the hotly-anticipated spin-off to the incredibly successful Fast & Furious franchise. 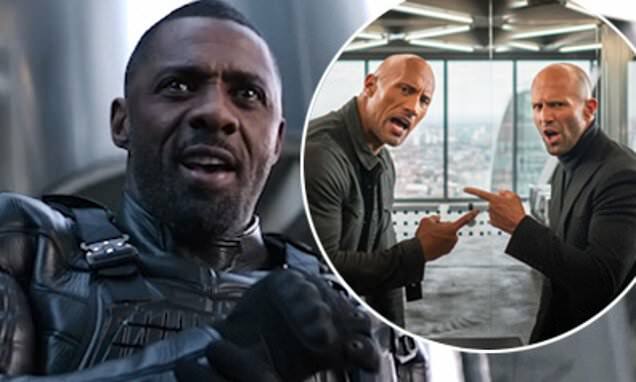 And the trailer for Fast & Furious: Hobbs & Shaw promies yet more explosive action as the dynamic duo go to war with villainous mercenary Brixton in the upcoming film. He continues: 'I am human evolutionary change. Bullet proof' as he is zapped with lasers that change the biological make-up of his body. The villain is seen walking casually up to armed police as they aim their guns at him. He responds: 'Bad guy' before ruthlessly dispatching the officers, beating them up and callously shooting one in the head. She continues: 'We need help. Brixton has gained control of an insidious bio-threat that could alter humanity forever, with Hattie, who is Shaw's sister, making the call to bring the two sworn enemies together to bring down Brixton. Hulking lawman Luke Hobbs (Dwayne 'The Rock' Johnson), a loyal agent of America's Diplomatic Security Service, and lawless outcast Deckard Shaw (Jason Statham), a former British military elite operative, first faced off in 2015’s Fast & Furious 7. The pair have never quite developed a warm friendship, exchanging bitter words and blows. Hobbs utters: 'I'm what you call an ice-cold cop. Whup a**' as he is seen attacking a group of thugs in a factory.